The Fire TV Recast DVR is a great addition to your Fire TV viewing experience as it adds the ability to watch and record live over-the-air TV. However, before you take advantage of its capabilities, you have to get it up and running. Make sure your Smartphone, Fire TV device, Echo Show and Fire TV Recast DVR will be on the same Wi-Fi network. You can’t set up Fire TV Recast from the Amazon website. It doesn't have a screen or its own remote control. Open the Fire TV app on your smartphone. Select Fire TV Recast when prompted and proceed through the welcome screens. Enable Location Access and select the range of your antenna then select Next (if you don't know the range, hit next anyway). 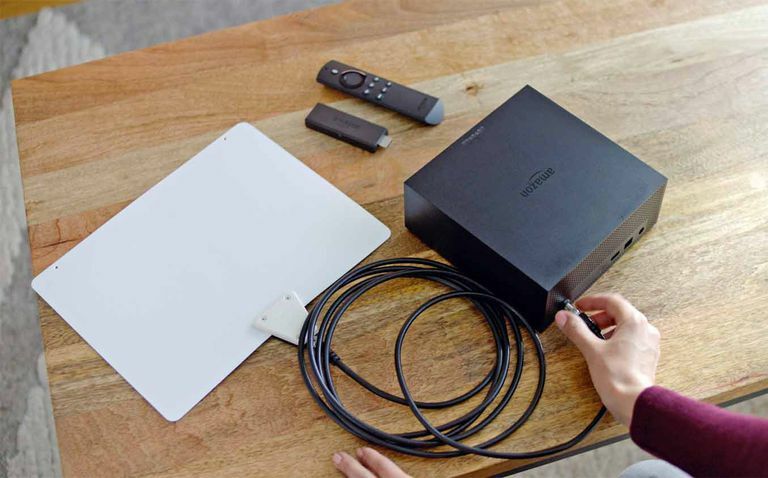 The Fire TV app will guide you through antenna connection and placement tips. If using an indoor antenna, placing it near or on a window is preferred. Also, place Recast where the antenna cable can reach it and place Recast near an AC power outlet. Connect the antenna and plug the Recast to AC Power. The LED on Fire TV Recast should start blinking white. If not, make sure all your devices are plugged in and on. Hold the Fire TV Recast Connect Button (located on the back) for 8 seconds. Connect the Recast to your network (Wi-Fi or Ethernet). Once the internet connection is confirmed, Fire TV Recast will be registered, and check for any firmware updates. If updates are found, it will take several minutes to download and install them. Do not perform any other tasks during this time. After any updates are installed, Fire TV Recast will scan for available over-the-air TV channels. The progress will display on the app screen. The number of receivable channels depends on the distance and/or geographical/physical barriers between the TV station transmitter and your location. You can move the antenna to receive more channels and repeat the channel scan process as many times as needed. You can also re-scan later if you add a new indoor or outdoor antenna. In the Fire TV smartphone app, you can go to Settings > Fire TV Recast > Channel Management > Channel Scan. On a Fire TV device Fire Edition TV/Fire TV stick or box, select Settings > Live TV > Live TV Sources > Fire TV Recast > Channel Scan. Fire TV devices and Fire TV Edition TVs should automatically pair when a Fire TV Recast is detected. If the Fire TV device and Recast are not paired, use the Fire TV app to select Settings > Live TV > Live TV Sources > Fire TV Recast > Pair a Fire TV Recast and choose your device. If you don’t see these options in the app, go to Settings > My Fire TV > About > Check for System Update and make sure you have the latest Fire TV software version. If you have an Echo Show, it should pair with Fire TV Recast automatically, if on the same network and registered to the same Amazon account. Once the above steps are completed the Fire TV Recast DVR is ready for use. After Fire TV Recast is installed, a DVR category will be added to the top menu bar of your Fire Edition TV or TV with a Fire TV stick/box connected. You can use a Fire TV remote or Alexa voice commands to open the DVR category to see (and use) Fire TV Recast features. On Now lists shows airing for received channels. Select one to watch or to set a recording. When watching Live TV via Recast, you can pause, rewind, and fast forward up to 90 minutes using Alexa or the player controls on Fire TV devices, Echo Show, or Fire TV app. The Fire TV Recast can't record from streaming services such as Netflix, Amazon video, Hulu, etc. It only allows the recording of live over-the-air TV broadcasts. The On Now row may also list any live TV services from Live TV internet streaming apps or Prime video, but since these aren't provided through an antenna the Recast can't record their content. You can watch any recordings that you have made by selecting them from My Recordings Bar using Fire TV remote buttons or Alexa. To further explore what is available to watch or record, Fire TV Recast includes a 14 day Channel Guide. You can select the Channel Guide from the DVR Manager row or just tell Alexa “Go to Channel Guide.” The Channel Guide includes TV listings for available channels. You don't need to enter a channel number. Just use your Fire TV remote to select it. You can schedule recordings up to 14 days in advance. Also, through on-screen prompts, you can record single TV shows or an entire series as the episodes become available. Depending on if you have the two or four tuner Recast, you may be able to record two or more programs on at the same time on different channels. You can also watch a program or previous recording, and record one or more programs at the same time. After setting up a recording it is placed in the Scheduled Recordings/Recording Priority list which can be accessed via the DVR Manager. If you need to access additional Fire TV Recast settings, you can do so through the DVR Manager. If you have an Echo Show, Fire TV Recast will be added to your Live TV viewing options. You can start a recording by saying the program's name: "Alexa, record Gotham". The Echo Show will record all upcoming episodes unless you cancel them. Echo Show can display Recordings that have been made. Tell Alexa to pick one by number and play it. In addition to using the Fire TV Smartphone app to set up Recast, you can also use it as a remote control to initiate play, pause, FF, RW, etc... as well as control over-the-air live TV via On Now and access the list of your recordings and play them back or start a recording once a program starts (you can't schedule recordings in advance). You can also use the app to record a live show when away from home, as well as watch recordings that you have already made as long as you are in communication with your home network via a Wi-Fi or Cellular connection. You can't download recordings from the Recast to your smartphone to take with you for offline viewing. You can also access more Recast settings from the Fire TV Smartphone app. Only one Recast is allowed per Amazon Account. You can't physically connect Recast to a TV as it doesn't have HDMI or AV outputs. This also means that since there are no physical connections, you can't copy Recast recordings onto VHS or DVD. Whether you have a 2 or 4-tuner Recast, viewing live TV or recordings is limited to two TVs at the same time.